Discussion in 'Nintendo Game Development' started by davidthomas, May 21, 2014. The revision of the board in the DVD-XV10 is a RJB2312C. There are differences compared to the one in the Q. It has the added ram for the pal region also has an Analog Devices chip ADV7170KSU. It has the two same connectors that the RV31 has. So has anyone managed to get the downloadable disc working? I've got a panasonic Q that was fully region modded. It played Pal DVDs but one day i turned the plug off before it had shut down and then was no longer able to play Pal DVDs (i feel American DVDs continued to work). So what do people think went wrong here and will the service disc fix this? Try to Factory Reset your Panasonic Q : in DVD mode (without disk), just hold "STOP" and "PAUSE" on the front panel while you press "<10" button on your remote control until "INITIAL" appears on LCD screen. If it doesn't work, maybe the extra-ram or the microchip for DVD region free is dead :/ I don't think the service disk is necessary in this case (and for the moment, the downloaded image disc for the Service Disc doesn't work). This is interesting.. I was under the same impression about using the smallest file, but opted for trying DVD Decrypter to burn the .GI files. Oddly, DVD Decrypter wouldn't recognize any of the files except for RV31.gi. It actually burned the complete disk and boots the image. I'm about to try it with the codes, I just forget them and wanted to revisit these forums to see what progress was made. I will update momentarily. Problem: The image is 8191MB and a blank DVD is 4482 MB. Two options: Overburn or Truncate. Which choice ? Like Primo Prassi that's been discussed in this thread and he even said in his post he used to create the image? Step 1: There's not really a 'Standby' Button on the remote.. I assume this is just to 'turn it Off and On'.. don't think it's important but can't be sure. Step 3: Enter Setup... there's no actual button for Setup, except you can access it by pressing the bottom left button (with red writing) and top right by pressing them simultaneously. Step 7: After inputting the code, the Disc doesn't read again.. it attempts to read but doesn't play. After watiing and re-booting the system never wants to play NTSC videos... only NTSC-J. So clearly there's some other problem, either with inputting these codes, or with the burnable DVD .gi file. Famiac if you're reading this, thanks for uploading the .GI. Do you remember if this Disc worked for you? I think you said it did. Found out the code for Region Change is '3192'.. however that didn't work either. '3193' is more for Macromedia disable. Just tried the whole process again with my original disc. It works. “Setup” refers to “Preferences” which can be accessed by holding the shift key and hitting the top right button, as has been said before. If i had a proper way to rip the disc, i’d be happy to, but neither .iso nor .gi has worked for people, it seems. Maybe Prassi Primo didn’t actually rip the DVD properly? 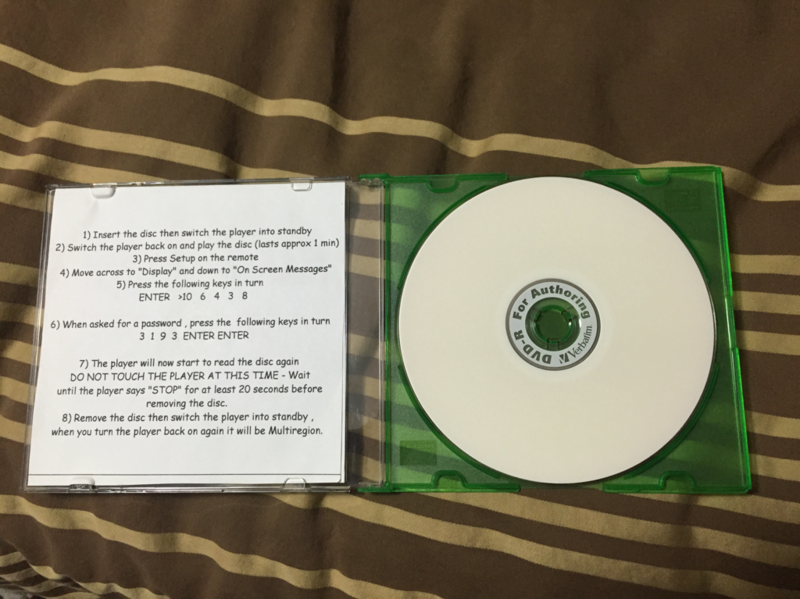 I talked to someone who used to burn this disk using the methods explained here, I managed to contact him through a different forum. He hadn't done it for at least 10 years, but mentioned that it's possible the Disks I'm using just don't hold the data anymore because they can lose their endurance if improperly stored. Aside from that, it's possible Prassi didn't extract it properly. There's also info that if you're using a newer version of Prassi the tool that makes macromedia copies readable was disabled with some .dll file. If anyone has a copy of the original Primo Prassi (it came with the DVDS20 burner) getting hold of that original app may be a way around the error. I definitely want to get this disc preserved before bitrot eats it. In its current state, it is still working properly and I just used it a couple weeks ago to redo my panasonic Q after I replaced some parts. If someone has a guide on how to use Primo Prassi the right way, then maybe we can get this done sooner than later. Hey everyone, so I'm reading the thread with great interest. I noticed the .gi files posted are a little bigger than what a DL DVD supports. For those who are willing to purchase, the Sony Optiarc AD-5290S-PLUS overburns DL+DVD media to 8.7GB, more than enough for the .gi images. I used it in the past to burn proper backups of Xbox 360 games that were larger than the standard 8.5GB DL media. The drive is on sale right now on Newegg with free 2 day shipping from Shoprunner, when you sign up. Make sure to use a DVD+DL disc for overburning, and set the bookype to DVD-ROM in ImgBurn before creating the disc. Mainly because players around that time had a hard time reading + Discs or not reading them at all. Today's modern players don't have this limitation anymore. It's because the file has extra information that doesn't get burned. Its also not designed for retail discs or burners. You have the proper burner, right? Assuming a good backup is produced, you'll be able to burn it? I got 2 Panasonic Q consoles here. anyone willing to sell me the Dvd-r disc to make it region free? The disk is not meant to make the Q region free; you can only enable NTSC-US dvd playback. PAL DVD requires also an hardmod. The Gamecube side still needs another hardmod to enable region free gaming (a switch for NTSC-US games or a modchip for PAL and backup loading). Let me clarify what I’m trying to accomplish. I’ve already opened the consoles and moved the region resistor on the GC motherboard to USA. So now I can play gamecube games from my region (Canada). I also switched the menus to English. All I need is the service disc to switch the region on the DVD player to region 1 so i can also play DVD movies. I don’t need a Japanese or PAL DVD player. Can anyone with the special burner burn me a disc and send it to me? Please PM me. To play pal dvds, you need to add some extra chips AND the service disc. Are you saying you just want it to play USA? I'm in the exact same situation. Just need that service disc for the DVD player. Can you let me know if you have any luck getting one? I'd like to buy one myself but can't find it anywhere. Yes. I just want the Q to play USA DVDs. Nothing more. No one here burns this DVD as a service for the community? I'd like to use the DVD function on my Q but its not a huge deal to me. Its likely most feel the same way too which may be partially why this hasn't been accomplished yet. Also may not be worth it monetarily. I'd definitely pay a reasonable amount for a copy.